Need some help on these next two. From a memory thats fading faster than the colours in the pictures, they are the 1174, or possibly the 1173? Reckon that these are both on R1129, Chiang Saen - Chiang Khong going over Kiu Khan hill after the landslide, or was it before they'd asphalted the road even? Not so long ago. The Mae Chaem - Khun Yuam road before it was asphalt. Probably does not look a great deal different today, except the dirt road is now a black one. The Doi Ang Khang - Nor Lae road not long after they built it. It's still a beauty & the drop off is the steepest in North Thailand. R1149 the Doi Tung road, before the Mae Fah Luang foundation had started. Note the lack of trees. The MFL Foundation has done a fantastic job re-foresting this area! Still on R1149, but the Burma border road from Doi Tung -Mae Sai. 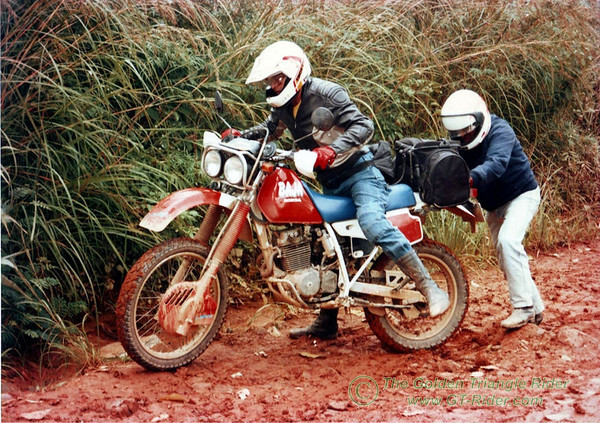 Almost as steep as the DAK - Nor Lae road, & when the clay was greasy it was a killer if youre tyres were at all worn down. Negotiating a stream, probably not very competently en route to Khun Pae, S-W of Chomthong. Once a foot came off the pegs for a dab, you never got them back on bouncing over the rocky stream bed. What about the riding kit though? Riding kit? Mmmm....... You did,nt get those trousers from TJ did you? Another viewpoint. "Rock Tower" above Nong Hoi & overlooking what used to be the Erawan Resort. Note the red track road. I believe there is a real road to "rock tower "nowadays. I think my Honda wing pictured was my 2nd Wing before the big bore kit & extras. But I can see this one already had the front fork brace & Koni rear shocks. Anyone recognize the little guy on the right? I wondered what photo you were going to dig up of me? Now where is my scanner & those old photos of you inside "LoveBirds"? Shawn in Oz wrote: I wondered what photo you were going to dig up of me? Got some more coming, when I get time. Now here's a beauty. When I actually walked & hiked a bit. But where the hell is it in North Thailand? Anyone know? Franz, sorry but you're not in the right part of thecountry. It is in the north & the peaks are about 1500 -1700 metres. Forgot about this one & the answer: Doi Tung, just above the temple entrance. Who wants to go there next & get some new photos for the GT Rider forum? If the weather's clear you can get amazing panoramic views all the way to the 'Khong!. Great memories "pappa david" the roads are real adventure stuff and the bikes basic single thumpers. Now the roads are highways and some of the bikes are worth the same as a house! I have missed so much by taking up riding from 1980-2010. I will have to live vicariously through these posts and photos. Some of those dirt roads are still under that asphalt now.....just waiting to come back. i think MTX125 and XLR250 baja is very new in that time !!! nI know Jon Boyes very well. Many times I visit him in his village. I think in the beginning now nearly 25 years ago. I heard he die already. Sorry for him he was a nice english guy and he gave me many information about the hilltribes in this aerea before. When we visit his village we gave the people a lot of medicine and something more. It was always a good feeling to visit Kiew Khan Village and John. Sometimes after so many years when I passed this area I m a little bit sad. Everything change so much. 150 % not the same like before. Sorry for my low english. Woman in the Village in traditional clothes and now ... everything is gone. Maybe MC. Donalds next.... the culture is gon. Unbelievable I bumped into Jon Boyes a few days ago. We'd not met for 15 years, but he's been retired & living in a village near Chiang Saen for 12 years & totally content with his life = he doesn't even have a mobile phone, such is his bliss. Cheers to any guys who ever knew Jon or even stayed at his Hmong GH in Kiu Khan. Brilliant stuff here. One never took enough photos back in the day. Just didn't realize how much you would appreciate them later. Obviously having a roll of 24 or 36 of film limited how much you could capture compared to today's digital age. 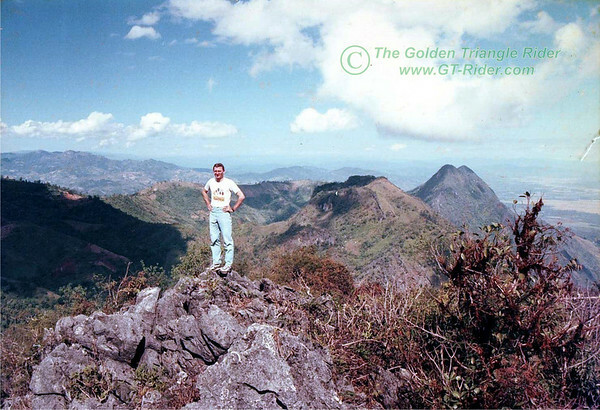 Did my first ride in the north May 1992 on a rented scooter around Mae Hong Song abd I don't think I have a single picture of the bike or the roads. What a pity. Did the Samoeng loop 1995 and should have some pictures from that trip. Need to dig up and see what I got. 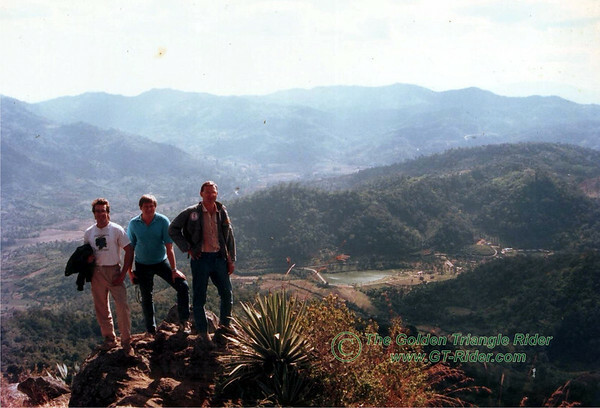 Golden Triangle 1986 Before it was fully commercialized! A beautiful flower field somewhere in the GT - There wasn't many fields left by then mostly grown for local hilltribe use! Songkran Thapae gate 1998 A much more pleasant occasion than the over exuberance of todays version! Nan Province near Pua? 2000 - Very smokey!!! Stayed there one night great experience! I recall we crossed some rickety bridge across the Nan river somewhere? North of Pua? I will have to check my old photos from Nan. Bangkok Floods - Chautuchak to Ladprao Intersection Sat 5th / Sun 6th.